It was 51 years ago – Saturday 17th September 1966 to be precise. Grand Prix Formula 1 cars could still be seen competing in non-championship races, a cluster of which took place in spring providing valuable testing opportunities for the new season’s cars but one of the best, the Oulton Park Gold Cup, then organised by the Mid-Cheshire Motor Racing Club, usually held in the autumn. With the race on Saturday, practice took place on the Friday when admission to the paddock was completely free, providing an excellent opportunity to see the cars – and drivers – at close quarters and watch mechanics at work out in the open. There were no pristine pit garages backed by rows of huge transporters and hospitality palaces. At best, an area of the grass-covered paddock might be roped off to provide a temporary working space. 1966 was the year of the ‘return to power’ for grand prix racing with the doubling of the engine capacity limit from 1½ to 3-litres. The Brabham team were the best prepared for the change with their relatively modest but effective Repco power units and, by September, Jack Brabham had already clinched the World Championship. They brought two cars for Brabham and New Zealander Denny Hulme who would become champion the following year. In their usual way, BRM had approached the new formula with an over-complex engine design, this time an H-16 layout of which three were present at Oulton, two of them in P83 BRMs for Graham Hill and Jackie Stewart and the third in the works Lotus 43 to be driven by Jim Clark. For Clark’s team mate Peter Arundell, Team Lotus brought a 2-litre V8 Climax-powered Lotus 33. Clark’s engine expired in practice, however, and he took over the 33 leaving Arundell to spectate. The race turned out to be an exciting battle between the Brabhams and BRMs with all four works drivers leading at one time or another until, almost inevitably, the H-16s failed, leaving Brabham to win from Hulme with Clark, having driven as only he could and even survived a spin in his efforts to keep up with the 50% bigger-engined cars, coming home in third place. 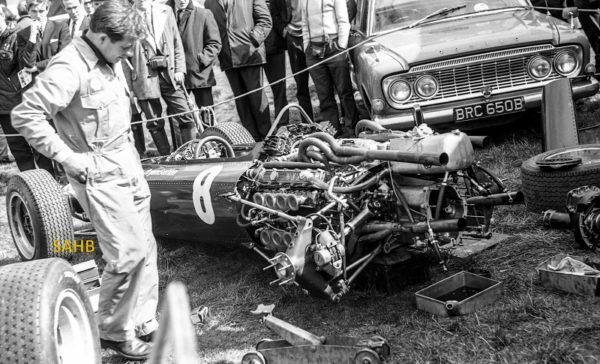 The photo shows a BRM mechanic and Jackie Stewart’s car – propped up on a small suitcase! – with its transmission dismantled after practice. Note the rope secured behind the Zodiac’s windscreen wiper, all that was needed to hold spectators at bay. Words and picture by Peter McFadyen.